Spy Hunter is getting another fresh face this fall, with a new game for handheld systems. The premise of the game is more or less what it sounds like: you're a spy and a hunter. As the Agent, your mission is to stop bad guys and protect civilians. Your method of doing so is a super vehicle that you race around in, destroying enemies' vehicles. Your car, this time, is the G-6155 Interceptor, which is designed to "seamlessly transform from supercar to off-road assault vehicle to speed boat, allowing players to go where they like within the game's branching mission tracks." Players earn the ability to upgrade the Interceptor's various weapons and gadgets over the course of play. And of course, what fun is it wrecking your enemies without seeing how badly you've wrecked them? The announcement promises "thrilling crash choreography and a camera system that follows the action in slow motion to let players savor the destruction they created." Spy Hunter was originally an early-1980s arcade classic, brought to major consoles in 2001 with fully modern (at the time) graphics and mechanics. Two more games followed in the series, with the most recent—which had an on-again, off-again film attached—seen in 2006. 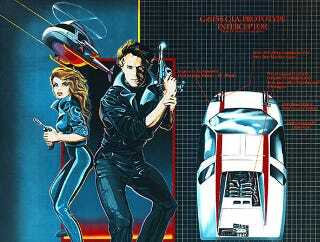 Spy Hunter is being developed for Warner Brothers Interactive by UK studio TT Fusion, who in the past have made a number of LEGO games for the DS and PSP. It's due for release on the 3DS and PS Vita sometime this fall.